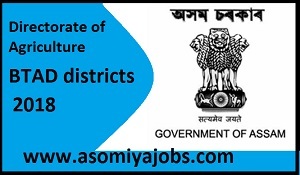 Directorate of Agriculture invited eligible and interested candidates to fill up the following post on contractual basis at a consolidated monthly salary and other allowances against the existing vacancy in Agriculture Department of BTAD districts e.g. Kokrajhar, Chirang, Baksa and Udalguri under Central Sector Scheme, NFSM. Qualification: A basic degree in Agriculture with computer skills. In case of non-availability of Agriculture raduates, candidate with basic degrees in life science may be considered. Interested candidates with requisite qualification may appear in the interview with their Bio-data (3 copies photograph) along with their original certificates on the scheduled date and time.